Award Year: 1995 Within the framework of health policy and U.S. labor market changes, Dr. Glied takes a close look at employer-based health insurance, its strengths and weaknesses. She examines: how employer-based insurance systems operate and perform in response to changes in the health care market; increasing differentiation among health plans; an apparent reduction in the number of long-term jobs; and the shifting demographic composition of the U.S. labor force. She studies the ability of employer-based insurance to pool risk, reduce administrative costs, and encourage innovation as well as the impact of the employer-based system on job lock, labor market performance, and industry competitiveness. In addition to developing theoretical models, the project integrates the findings of existing studies in economics and health services research, conducts new analyses using a variety of secondary datasets, and studies noteworthy examples of employer-based systems. Piecing these elements together, findings identify the linkages among health policy, the economy, and the future of employer-based coverage. 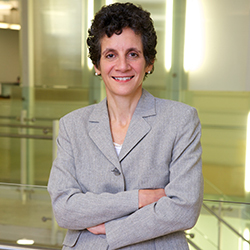 Sherry Glied is Dean of the Robert F. Wagner Graduate School of Public Service at Columbia University. From 2010 until August 2012, Dr. Glied served as Assistant Secretary for Planning and Evaluation, U.S. Department of Health and Human Services. She holds a B.A. in economics from Yale University, an M.A. in economics from the University of Toronto, and a Ph.D. in economics from Harvard University. Her research on health policy has focused on the financing of health care services in the U.S. She is an author of recently published articles and reports on women's health insurance, child health insurance expansions, Medicaid managed care, and the role of insurance in hospital care. Her book on health care reform, Chronic Condition, was published by Harvard University Press in January 1998. She is a past recipient of a Robert Wood Johnson Investigator Award, through which she has been studying the U.S. employer-based health insurance system. Dr. Glied's work in mental health policy has focused on the problems of women and children. She is a member of the MacArthur Foundation's Network on Mental Health Policy. She is co-author (with Richard Frank) of Better but Not Well: Mental Health Policy in the US Since 1950, Johns Hopkins University Press, 2006. Dr. Glied is a senior associate editor of Health Services Research; an associate editor of the Journal of Health Politics, Policy, and Law; a member of the editorial board of the Milbank Quarterly; and a member of the editorial committee of the Annual Review of Public Health. Glied, S. Public Health and Economics: Externalities, Rivalries, Excludability, and Politics, In The Contested Boundaries of American Public Health, eds. Colgrove, J., Markowitz, G., Rosner, D. New Brunswick: Rutgers University Press, 15-31, 2008. Glied, S.A. The Employer-Based Health Insurance System: Mistake or Cornerstone? In Policy Challenges in Modern Health Care, eds. Mechanic, D., Rogut, L., Colby, D., Knickman, J. Rutgers University Press, 2005. Briffault, R.A., Glied, S. Federalism and the Future of Health Care Reform, In The Privatization of Health Care Reform: Legal and Regulatory Perspectives, ed. Bloche, M.G. Oxford University Press, Inc., 2002. Navathe, A., Clancy, C., Glied, S. Advancing Research Data Infrastructure for Patient-Centered Outcomes Research. JAMA, Sep 21 2011, 306(11): 1254-1255. Laugesen, M., Glied, S. Higher Fees Paid to US Physicians Drive Higher Spending for Physician Services Compared to Other Countries. Health Affairs, Sep 2011, 30(9): 1647-1656. Koh, H., Graham, G., Glied, S. Reducing Racial and Ethnic Health Disparities: The Action Plan from the Department of Health and Human Services. Health Affairs, Oct 2011, 30(10): 1822-1829. Glied, S. Side Effects: A Dose of Competition and Access to Care. JHPPL, 2006, 31(3): 643-670. Feder, J., Nichols, L., Thorpe, K., Westmoreland, T., Glied, S., Bilheimer, L., Folz, C.E. Health Policy Roundtable - Policy by Numbers: The Role of Budget Estimates and Scoring in Health Care Reform. Health Services Research, 2005, 40(2): 347-59. Glied, S., Stabile, M. Avoiding Health Insurance Crowd-Out: Evidence from the Medicare as Secondary Payer Legislation. J of Health Economics, 2001, 20(2): 239-60. Glied, S.A. Challenges and Options for Increasing the Number of Americans with Health Insurance. Inquiry, 2001, 38(2): 90-105. Glied, S., Stabile, M. Generation Vexed: Age-Cohort Differences in Employer-Sponsored Health Insurance Coverage. Health Affairs, 2001, 20(1): 184-91. Glied, S.A. Health Insurance and Market Failure since Arrow. JHPPL, 2001, 26(5): 957-65. Glied, S., Stabile, M. Explaining the Decline in Health Insurance Coverage among Young Men. Inquiry, 2000, 37(3): 295-303. Glied, S., Stabile, M. Covering Older Americans: Forecast for the Next Decade. Health Affairs, 1999, 18(1): 208-13.